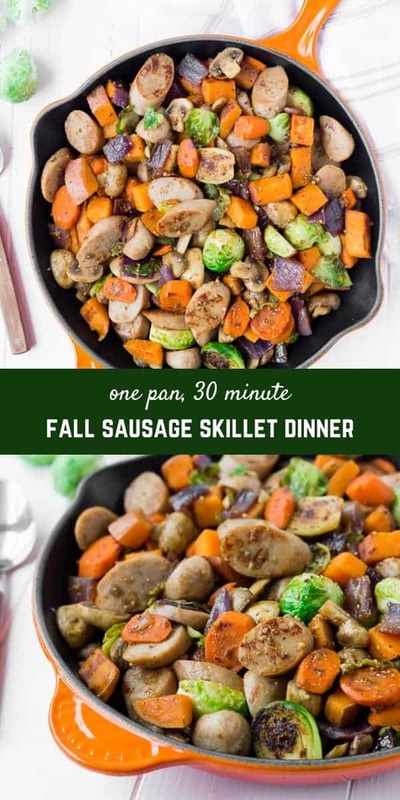 This one pan sausage dinner is the perfect 30 minute meal on a night when you want a nutritious meal but you really don’t feel like cooking! I made this on Instagram stories a month or so ago and the consensus was that you guys wanted this recipe! It’s one of those that I just throw together when I don’t especially feel like cooking (which is more often than you might think! ), but it’s a great healthy meal that uses up some of the stuff in your fridge. I usually keep a package of chicken sausage in my fridge and it is great for quick and easy meals like this one. Slice it, sauté it over high heat so it gets golden brown and caramelized, and mix it with whatever vegetables you have. Dinner, done! 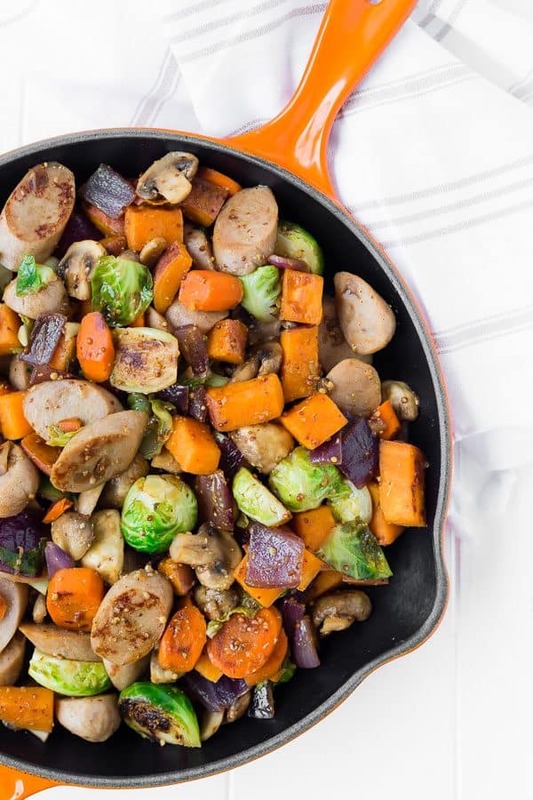 For this particular rendition of that one pan meal, I used a lot of fall vegetables and flavors. Despite a pending snowstorm in Michigan and our Christmas tree standing in our living room, I’m still hanging on to fall because it seems like we barely had one! 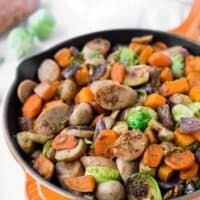 I used red onion, sweet potatoes, carrots, mushrooms, Brussels sprouts, and a nice apple chicken sausage. Sometimes I add apples or regular potatoes to mix this up a little. It really is whatever I have on hand, usually. Once those have a good head start, you’ll add the next level. This is where you’d add bell peppers, Brussels sprouts, broccoli, cauliflower, those types of vegetables. 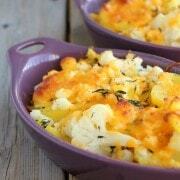 You’ll want to add vegetables that have the shortest cooking time last. 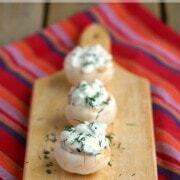 Things like mushrooms, asparagus, and spinach cook quickly and you’ll want to add them last to prevent overcooking. 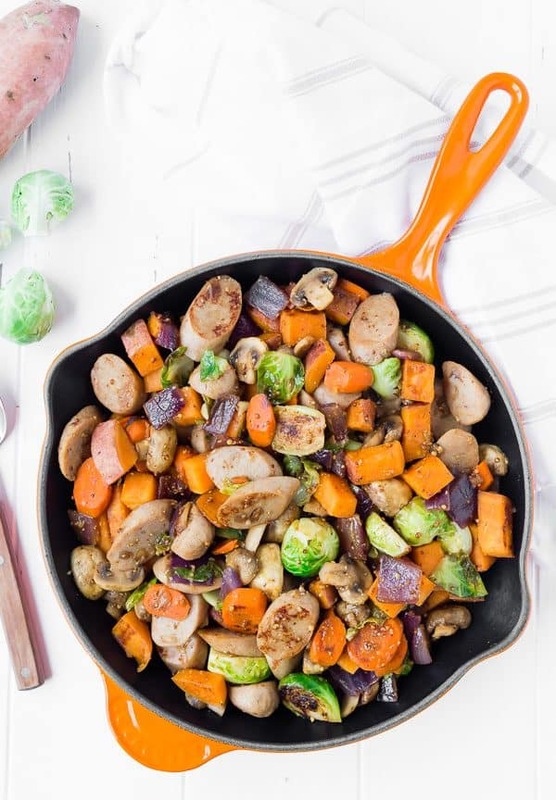 Tip: Use the largest skillet you have (that has a lid) so that the vegetables have lots of space. This will help them caramelize and brown, rather than just steaming from being too crowded in the pan. There are a couple of ways that you could make this vegetarian. My favorite is to leave the sausage out. When the vegetables have cooked and you’ve added the sauce, move it all to the edges of the pan and crack and egg in the center and fry it. Vegetable hash with an egg – so good! Another way to boost protein if you’re leaving out the sausage is to add a protein-packed grain like quinoa, or to add beans or cheese. All great and tasty additions, with or without sausage. It’s already naturally gluten-free if you use a gluten-free sausage. You can do this by choosing a compliant chicken sausage (mustard, too) and leaving out the maple syrup in the sauce. Add bacon. RIGHT? I recommend cutting the bacon up into small pieces, cooking it first, and then removing it to a paper towel-lined plate. Reserve the grease and use that instead of olive oil to sauté all the vegetables in. Add the bacon back in immediately prior to serving. 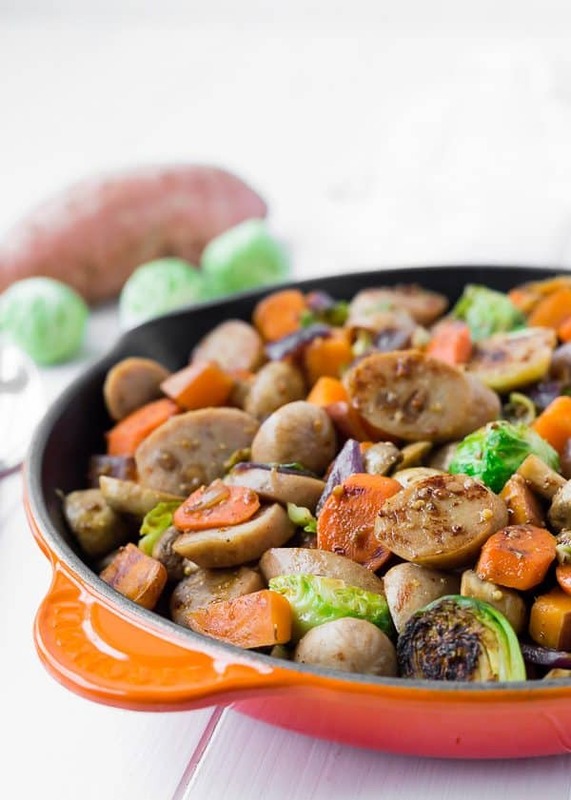 This one pan sausage dinner is the perfect 30 minute meal on a night when you want a nutritious meal but you really don't feel like cooking! Heat olive oil in a very large skillet (choose one that has a cover available) over medium high heat. 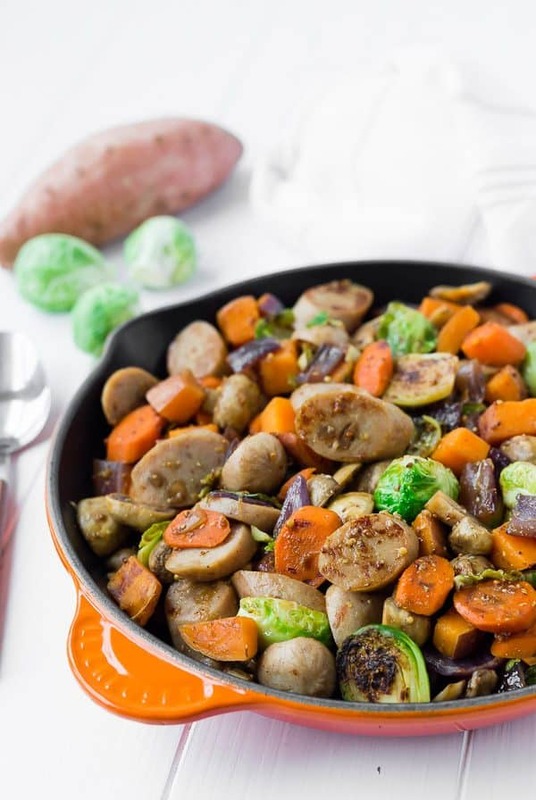 When oil is glistening and hot, add onion, carrots, and sweet potatoes. Cover and cook for 5 minutes, stirring once. Add Brussels sprouts, stir, and cook for another 2-3 minutes, covered. Add mushroom and sausage and continue to cook uncovered, stirring, until mushrooms are cooked and sausage is browned, about 5 minutes. Meanwhile, in a small bowl or measuring cup, whisk together maple syrup, apple cider vinegar, and dijon mustard. Taste, and if desired, add more maple syrup if it seems too tangy, or more vinegar if it seems too sweet. 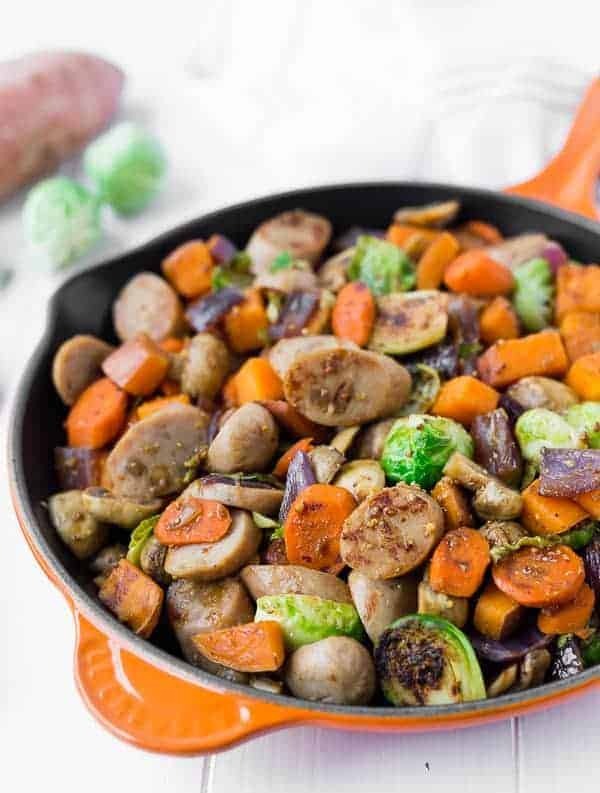 Pour sauce over vegetables and sausage, stirring to coat all ingredients in the sauce. Taste and season as desired with salt and pepper before serving. If you'd like to add apples to the mixture (so yummy! ), add them in when you add the sausage and mushrooms to prevent them from turning into applesauce. Choose a firm apple sauce as Granny Smith or Honeycrisp. I love the appearance and taste of a coarse-ground mustard, but any dijon mustard will work in this recipe. Note: I cooked it in a larger skillet than depicted in the photo. 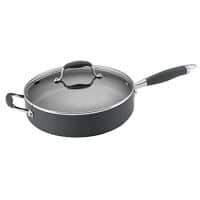 Choose a large skillet with a lid. Verdict: One of my absolute favorite meals – and so easy to make! 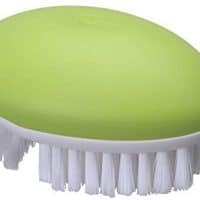 Husband’s take: Ben loves this – probably not as much as me, but he still loves it! Sometimes I make rice to go with it for him. Changes I would make: None are necessary but feel free to try some of my suggestions I mentioned above! 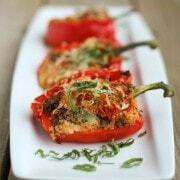 I like to put smoked paprika and a splash of red wine vinegar when I make this. Red potatoes are good too. I pretty much use whatever potato veggie combination I have in my pantry. The chicken sausage is essential for flavor in my opinion.